Content: Nowadays Kloq consists of singer Dean Goodwin, bass player Tim Jackson, drummer Alex Baker (the last new member on board) and producer and programmer plus founding member Oz Morsley (ex-Empirion). Morsley once started as a solo-project, but progressively evolved towards a real band, which also explained the move from the pure electronic-violence and acid threatened debut album “Move Forward” towards the pure electro-like “Begin Again”. Two years after their second full length Kloq is back on track unleashing a self-released EP with 4 songs. I like the concept to avoid the usual load of remixes from one and the self song. We here get 4 different songs, which might indicate the further direction of the next album. 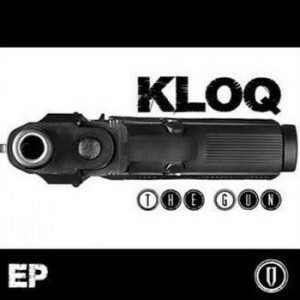 “The Gun” clearly moves back towards harder electro fields and Kloq has been always a genius project when it comes to manipulate and create sounds. The stamp of Oz Morsley clearly emerges from the music while the rock/punkish touch of the last work still comes through. The global production is once more outstanding. The mixing is a total delight for the ears. The opening song perfectly reflects all the aforementioned elements. “We Are Now” has this unique Kloq-like cyber-rock touch and is characterized by a solid chorus. The vocals remain not that typical for pure electronic music, but Kloq is mixing different influences, which comes through in the vocals as well. The title song coming up next is a solid smasher. “The Gun” is driven by breakbeat orientated drums, but the overwhelming sound blasts emerging from this cut definitely are the main attractive element here. My favorite song is without a shadow of a doubt “Drive”. Kloq here deals with genius and sophisticated sound manipulations. This is a divine fusion between raw electronics mixing elements of trance- and cyber-punk. No doubt about it, this is a potential dancefloor killer. The last song is not exactly the most inspiring one, but it remains better than any kind of average remix. Conclusion: I’ve been never deceived by Kloq and I’m quite excited to hear the new stuff sounds more into pure electronics again. 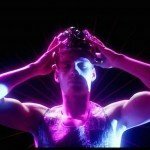 Best songs: “Drive”, “The Gun”.